At a very young age many of us are trained to take care of our health and hygiene. From washing our hands before we touch food to brushing our teeth at least a couple of times a day – it all revolves around prevention.Snapback Hats Wholesale.Wholesale Snapback Hats.cheap snapbacks online.Cheap Snapbacks.Cheap Snapbacks Free Shipping.Cheap Snapbacks Hats for sale.Wholesale Snapback. We are taught to understand that if you don’t take care of yourself, you might experience negative symptoms like a cavity in your teeth, a congested nose or blurriness in the eyes. Everyday we read an article or hear about a deadly virus in the news, but many people are not aware of things that affect our health in a negative way until it is too late. Hearing loss is an example of a negative symptom caused in many people today. Especially since we are impacted by the digital economy we live in; we are prone to noise from the time our alarm clocks go off. Hearing problems often start slowly over time. and rarely lead to total deafness. Conductive hearing loss (CHL) occurs because of a mechanical problem in the outer or middle ear. The three tiny bones of the ear (ossicles) may not conduct sound properly. Or, the eardrum may not vibrate in response to sound. Fluid in the middle ear can cause this type of hearing loss. Sensorineural hearing loss (SNHL)is due to a problem with the inner ear. It most often occurs when the tiny hair cells (nerve endings) that move sound through the ear are injured, diseased, do not work correctly, or have died. Learn more about Hearing Protection. It has also been determined that untreated, hearing loss can lead to depression, dissatisfaction with life, reduced functional and cognitive health, and withdrawal from social activities. 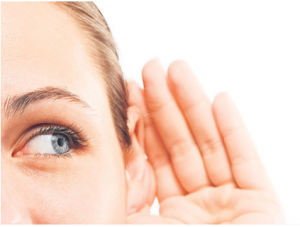 What you need to know about hearing loss is that is irreversible. So how do you know if you have hearing loss? Quoted by the Canadian Foundation of Hearing. > I often miss parts of conversations and continually ask people to repeat themselves. > I find that the high and low tones of many sounds have disappeared. For example, I find it difficult to hear birds singing. > My family or friends complain that I listen to the TV at too loud a volume. > I have to turn up the volume on the telephone/cellphone to hear properly. > I have difficulty distinguishing speech from background noises. For example, I often have difficulty following dinnertime conversation, while others are talking and music is playing. > I find myself straining to read lips and facial expressions just to understand what someone is saying to me. If you answered yes to three or more of these questions, then you need to have your hearing checked by a qualified audiologist. For a list of audiologists in your area, refer to your phone book or contact the Canadian Academy of Audiology or in the United States click here. In many cases, testing your hearing is a free service audiologists often offer. Remember hearing loss prevention is one of the many things you can avoid if you know what to avoid and what to look for. So listen up and be aware of sounds and noises that can cause damage over time to your hearing.